The handsome Greater Swiss Mountain Dog is a descendent of Roman Molossian dogs, and shares the imposing size and strength of those ancient mastiffs. The Greater Swiss is one of four Swiss mountain dogs, along with the Bernese, Entlebucher, and Appenzeller. Though tough and powerful, the tri-colored breed is gentle and sweet-natured. Swissies are known to be devoted companions who are kindly with children. Keeping this working breed active is important, because he is at his best when he's on the job. Swissies love proving their mettle in carting and drafting events, and would proudly carry a dog pack during a hike. Greater Swiss Mountain Dogs are affectionately called Swissies, and sometimes GSMD for short. Coat - Swissies are a double coated breed with a dense topcoat that is about two inches long. Their undercoat is gray or tawny in color, thick, and shows through at the neck. They are a mix of three colors: black, rust and white. This drafting dog is large and powerful, with a well-muscled body that is longer than it is tall. They are striking to look at, with their vibrant tricolor coat and imposing build. Their stride is purposeful, with good forward reach and strong drive from the rear. Swissies are alert, confident, and always at the ready for work. They have a bold personality that is a mix of easygoing, playful, and independent-minded. The Greater Swissy is the oldest of the four Sunnenhundes (Swiss Mountain Dogs). Their ancestors were brought to the Swiss Alps by the Romans and bred over time with regional dogs to create the four types—The Greater Swiss, Bernese, Appenzeller, and Entlebucher. Swissies were all-around farm dogs, guarding the property, herding, and drafting carts to market. Once widespread, their numbers dipped after the Industrial Revolution. Dog researcher Albert Heim is responsible for the dog's name, having seen them listed as 'short-haired Bernese Mountain Dogs' at a Swiss Kennel Club show. Heim pushed for recognition of the dog as a separate breed and succeeded in 1909. Swissies were imported to the US in the late 1960s and recognized by the American Kennel Club in 1995. Greater Swiss Mountain Dogs are devoted to their families, and make gentle, playful companions. They are mostly easygoing, but have a tendency to be stubborn and territorial: the GSMD is an ever-watchful dog who will protect his territory and his people. Are Greater Swiss Mountain Dogs Good with Kids? Yes. Greater Swiss Mountain Dogs are generally patient and gentle with children. Because of their size, however, they are not an ideal breed for families with very young children. Kids shouldn't be given the responsibility of walking a GSMD until they big enough to manage them. Are Greater Swiss Mountain Dogs Good with Other Pets? Greater Swiss Mountain Dogs accept dogs and cats they were raised with as part of their pack. Cats outside of their family are fair game, however, so the GSMD should be kept secured in the yard when outside. Greater Swiss Mountain Dogs are territorial and protective of their families and homes. Are Greater Swiss Mountain Dogs Good Guard Dogs? The GSMD's loud bark and imposing size will likely scare off burglars. They are always on the watch for unwanted visitors and will let the house know if any approach. The breed is not particularly aggressive, however. The Greater Swiss Mountain Dog enjoys a good play session, but he also likes to relax. They need more space than an apartment provides, unless they are taken out frequently for exercise. The GSMD has a loud bark. They're escape artists who will find their way out of yards that aren't well secured. Indoor Inside with their family is always the Greater Swiss Mountain Dog's preference for sleeping and relaxing. The rest of the time, they'd like to be outside working or playing. If it's hot or humid, the GSMD should be inside in an air-conditioned room because they are prone to overheating. The breed sheds throughout the year, but shedding increases when they blow their undercoat twice per year. Outdoor The Greater Swiss Mountain Dog's coat keeps them warm and comfortable when it's cold outside, and they relish spending time outside in the winter. They make excellent cross-country skiing companions. In summer, however, they should go outside mostly in the early morning and evening when it is cooler. Exercise The GSMD requires a few, moderate-length walks or play sessions to stay in prime condition. Endurance These working dogs have the stamina to spend several hours playing, walking, or herding, as long as they get plenty of rest breaks throughout. Running Miles: The GMSD isn't a long distance runner, but will happily accompany you on an easy jog of two to three miles in cool weather. Hiking Miles: Greater Swiss Mountain Dogs can take a hike of 10 miles plus. They'll be especially happy if they helping carry supplies in a dog pack. Never hike with your GSMD in hot or humid weather because they are prone to overheating. Food Generally, this breed requires about four to five cups of good quality dry dog food each day, over the course of two feedings. This will vary, however, based on their activity level and age. Talk to your veterinarian about the optimal diet and quantity of food for your GSMD. Alone Time Greater Swiss Mountain Dogs are tolerant of time alone, though they shouldn't spend the entire day by themselves because they require exercise and activity to avoid boredom. The Greater Swiss Mountain Dog has a low-maintenance coat for most of the year, when a weekly brushing and monthly bath are enough. When they blow their undercoat twice per year, however, they benefit from more frequent brushing. Clean your GSMD's ears with a gentle, dog-friendly cleanser to prevent dirt buildup that can cause infections. Brush their teeth several times a week, and trim their nails every month or so to prevent cracking. 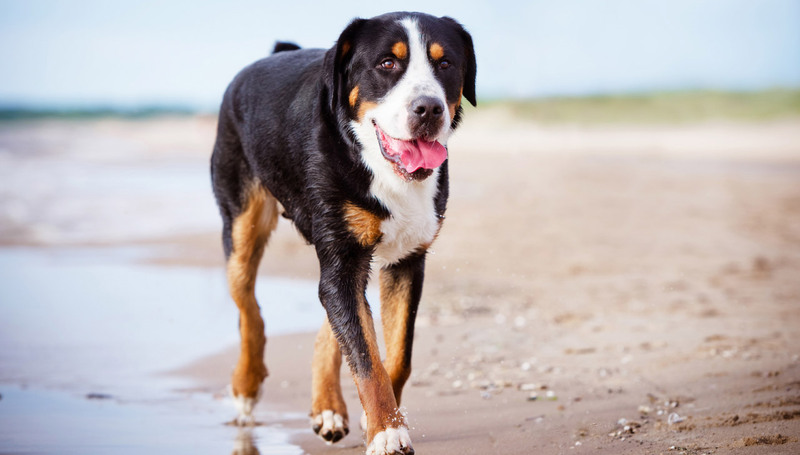 You can minimize serious health concerns in a Greater Swiss Mountain Dog by purchasing from a reputable breeder who engages in responsible breeding practices, and through screening for common diseases and conditions. Greater Swiss Mountain Dogs are smart and learn fast, but their stubbornness requires persistent training. Dog treats used judiciously go a long way toward motivating this breed. Avoid using a harness for training purposes, as this drafting dog will take that as an invitation to pull. It's wise to keep the smart GSMD busy with advanced training. The breed is a strong and steady athlete who excels at agility, drafting (pulling carts), hiking with packs, and herding. Greater Swiss Mountain Dogs are good at many things—herding, guarding, hauling—but they aren't natural hunters. Are Greater Swiss Mountain Dogs hypoallergenic? No. Greater Swiss Mountain Dogs shed and, as a result, leave pet dander in your home. Dander is the cause of most pet-related allergies. Are Greater Swiss Mountain Dogs aggressive? Rather than aggressive, Swissies can more accurately be described as assertive and self-confident. Problems arise when inexperienced owners allow their Greater Swiss Mountain Dog to become leaders of the family pack. This will definitely result in pushy behavior that could easily be mistaken for aggression. To prevent this, early, firm socialization and training are important, and you'll be rewarded with a Swissy who's easy to live with. Can Greater Swiss Mountain swim? Yes. Swissies have webbed feet and are usually strong swimmers after an introductory lesson. It's also a good form of summer exercise for the breed, which is at risk of overheating. Like all dogs, they should be monitored closely when swimming.